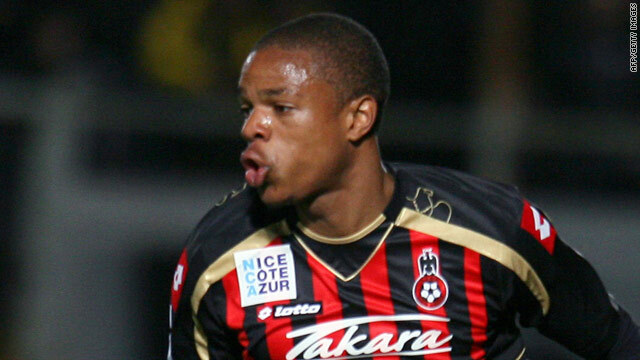 Loic Remy was one of the most sought-after players in Europe after his success with French club Nice last season. (CNN) -- French champions Marseille have moved quickly to boost their forward options by winning the race to sign highly-rated striker Loic Remy from Nice. The 23-year-old had been one of the most sought-after players in Europe after scoring 26 goals in 68 games in the past two Ligue 1 seasons. The former Lyon player passed a medical on Thursday and joined Marseille, who have lost the first two league matches of this season, for a fee of about $19 million. Marseille coach Didier Deschamps turned to him as a replacement for Senegal star Mamadou Niang, who joined Turkish side Fenerbahce this week, after being put off by the price of Sevilla's Brazilian World Cup star Luis Fabiano. Ivory Coast striker Bakari Kone and former Spain forward Fernando Morientes have also left l'OM since last season. "In as far as the expectations of the public are concerned, I'd hoped to bring in a striker of international caliber like Fabiano," Deschamps said in quotes carried by the UK Press Association. "But when I was told about the figures being spoken about I cannot ask the club to buy whatever the cost. I don't have the right to ask that. If the price is not reasonable, then stop." Remy, who has signed a five-year contract after being courted by English clubs such as Stoke and West Ham, said that Marseille's involvement in the UEFA Champions League was a key factor. "It's something I was looking for. After that, we know very well that many players want to play for OM. It is not given to everyone. When Jose Anigo came to offer me a contract, I took the time to think but have had no hesitation," he told club's website. Marseille had also been linked with another France international striker Andre-Pierre Gignac, but his club issued a statement on Wednesday denying having received an offer for the striker. Spanish club Sevilla have told English side Arsenal to improve their offer for France international defender Sebastien Squillaci. The 30-year-old center-back was left out of Wednesday night's defeat by Braga as he did not want to become cup-tied in the Champions League. Arsenal need cover with Mikael Silvestre, William Gallas, Sol Campbell and Philippe Senderos having left, with only young Frenchman Laurent Koscielny coming in. Croatia striker Nikica Jelavic is poised to join Scottish champions Rangers after refusing to play in Rapid Vienna's Europa League qualifier against Aston Villa on Thursday night, which ended in a 1-1 draw. Rangers agreed a $6 million fee with the Austria side and the 24-year-old, who will undergo a medical on Friday. Slovakia's young World Cup star Vladimir Weiss will also move to Glasgow after agreeing a season-long loan from big-spending club Manchester City, having been a target for Scottish rivals Celtic, Germany's Stuttgart and Italian side Sampdoria. The 20-year-old winger spent the second half of last season with English club Bolton before helping Slovakia reach the second round in South Africa. English club Liverpool left Argentina international Javier Mascherano out of the team for Thursday's 1-0 home win Trabzonspor in the Europa League, despite manager Roy Hodgson earlier insisting the wantaway midfielder would not leave unless an acceptable offer is received. Mascherano, 26, has two years left on his contract but a much-hyped reunion with former Liverpool manager Rafael Benitez at Inter Milan has yet to eventuate. In other Europa League ties, Russian runners-up Sibir Novosibirsk beat 21-time Dutch champions PSV Eindhoven 1-0 and former Germany captain Michael Ballack scored a late penalty in Bayer Leverkusen's 3-0 win over Ukraine's Tavriya Simferopol. Manchester City won 1-0 away to Romania's Timisoara thanks to a debut goal from Italy striker Mario Balotelli. Turkish club Fenerbahce lost 1-0 PAOK Saloniki, having already been knocked out of the Champions League, while fellow Istanbul giants Galatasaray were held 2-2 at home by Karpaty Lviv of Ukraine. Stuttgart won 1-0 away to Slovenia's Slovan Bratislava, while fellow German club Borussia Dortmund crushed Azerbaijan's FK Karabakh with two goals by Paraguay World Cup striker Lucas Barrios and Japanese forward Shinji Kagawa -- all coming in the first half. Celtic won 2-0 at home to Dutch side Utrecht, while Portugal's Porto won 3-0 away to 10-man Racing Genk of Belgium. Danish side Brondy won 2-0 away to Sporting Lisbon in the Portuguese capital, while Italian giants Juventus won 2-1 away to Austria's Sturm Graz thanks to Amauri's late goal.